(Beyond Pesticides, January 11, 2019) Plans to weaken farmworker protections from toxic pesticides were dropped by Acting U.S. Environmental Protection Agency (EPA) Administrator Andrew Wheeler, according to an undated letter sent to Senator Tom Carper (D-DE) late last year. Reports indicate the action was part of a deal cut by both parties that permitted confirmation of Alexandra Dunn to the EPA Office of Chemical Safety and Pollution Prevention in exchange for EPA concessions that would improve pesticide and chemical safety measures. While advocates are generally pleased with the outcome of the apparent deal, the irony that deals needed to be made for an agency with protection in its name to do its job is not lost. Under former EPA Administrator Scott Pruitt, the agency backtracked on provisions put in place during the Obama administration that would update farmworker protections following decades of inaction. Pruitt determined to revisit rules put in place that would require farmworkers be 18 to spray highly toxic pesticides, implement 25 to 100 ft application exclusion zones (AEZ) after pesticide applications, and permit farmworkers to have a designated representative obtain health and safety information on their behalf. These simple, commonsense protections were strongly opposed by the agrichemical industry, which lobbied EPA to backtrack and revise the aforementioned provisions. 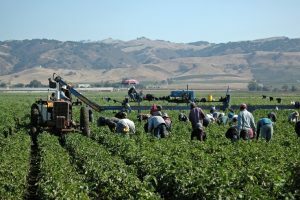 In March of last year, 28 Senators urged then-Administrator Pruitt to retain farmworker protections. But according to BNA news reports, Acting Administrator Wheeler had intended to move forward with the revisions as recent as October 2018. While the proposals were delayed as farm bill negotiations persisted, the agency had planned to send its changes to the White House Office of Management and Budget (OMB) this month. In the agency’s letter to Senator Carper, EPA gave no reason for its decision to drop its revision plans. “Although the subject matter associated with these potential changes has been subject to wide ranging public stakeholder meetings and public comments, EPA will withdraw its OMB submission to propose revisions to these rules and will not make any changes to the designated representative and minimum age provision,” the letter reads. EPA did not preclude changes to the application exclusion zone provisions, indicating that it would provide 90 days public comment should it proceed with further alterations to the rule. Environmental justice advocates are hopeful that finally implementing these regulations will lead to better health and welfare for the countless individuals who help grow the nation’s food. Currently, the average life expectancy for a farmworker is 49 years, compared to 78 for the general population. This is similar to the life expectancy of individuals living in the 1850s, and represents a completely unacceptable data point for any industry today in a developed country. Help promote a food production system that does not expose farmworkers and their families to toxic chemicals by purchasing organic whenever possible. Yes, organic uses pesticides, but those applied are only done so as a last resort, and the least-toxic pesticide products applied undergo several levels of evaluation by the NOSB, an independent stakeholder board consisting of a wide range of experts. To help better explain the benefits of organic food consumption, Beyond Pesticides invites readers to use the Eating with a Conscience database, which evaluates how toxic chemicals used used food items effect the environment and farmworkers. To hear first-hand the experience farmworkers endure day in and day out, watch Beyond Pesticides’ National Pesticide Forum workshop on Farmworkers, Families and Health. This entry was posted on Friday, January 11th, 2019 at 12:00 am	and is filed under Agriculture, Environmental Protection Agency (EPA), Farmworkers, Uncategorized. You can follow any responses to this entry through the RSS 2.0 feed. You can skip to the end and leave a response. Pinging is currently not allowed.